Thread: Patch for Dx8 cards please! Why cant the developers make an option to choose the shaders??? The game is running on Xbox and ps2....and on a pc with gef4ti not???? This is pathetic! Cant you get a DX9 card? I doubt the game runs and looks any good on a old GF4 and there are many DX9 cards available for cheap! They already have to make the game for xbox360, xbox, ps2 and all the diferent PC HW configurations, the PC version was built/optimised for DX9. Well, Doom3 worked with my old GF4ti (but it ran real bad and didnt look that good), the engine IOI uses is "multiplatform" so the game can be modified to run in several diferent platforms, the PS2 version must be toned down quite a bit.. If changing some textures is all it would take then yeah, i think they should have gone for it, starting to think they didnt make it has scalable has it should have been even if people choose to play in 800x600 resolution, i would rather do that than play it on a... conSole . Well there's a very easy explanation why they couldn't or didn't include the DX8 renderer. For one, hardware manufacturers want gamers to buy new cards. One way to force them is to force software developers to include a code to disable low level renderer. So here Nvidia paid Eidos a huge sum of money to do this. Call it whatever you want, business politics, bribery....but that's the way the industry works. It's just like how oil companies killed electric cars. Hey Cobra, thanks for that info. Just tested it and it worked fine. Sound is a little laggy though, but thats ok. So the only problem left is, that I have to tell the config which level to start to with. Everything else is fine. Can you fix that, eidos? Just make us at least be able to go into the game's menu to adjust our controls. lol. "wasd" s*cks. this is what I'm talkin about. enough space, latest drivers etc. as you can see on the following screenshots from the demo, it works on my crappy system with my crappy graphic card. and it really works nice, though its for sure not the same like it would be on a high end system. but thats not the point. I just want to play the game, and I can't even go into the menu. 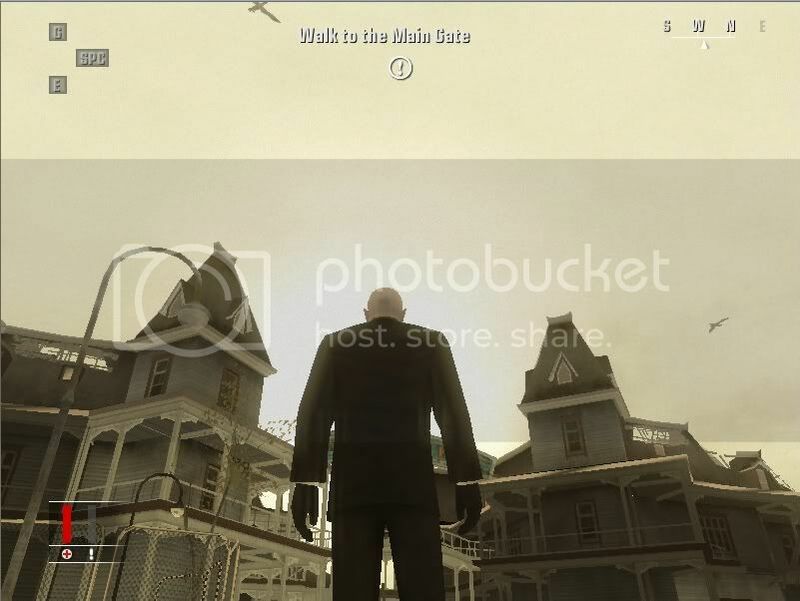 So I just have to tell the config to start this level on hitman startup. I mean, c'mon, I really wanna play it. All you need to do is, to let me into the game's menu, and maybe let me shoot. lol. please eidos, I'm moving to another country in about two months and I won't buy any new computer or computer parts that I won't take with me anyways. Let me play this game, or release some add-on for one of the other hitman titles. I really don't care what it looks like (as you can see on the screenshots), I'm just a fan. It looks bad but playable, they should consider it if they release any other patch imo. Wow, it does look impressive.....! I thought the game would dark and gloomy with all the sahders disabled! actually it does look like a very, very rough version of tomb raider ("angel of darkness", or what that game was called) without the shaders. but on these screenshots, there are some shaders activated. some lightning effects which I haven't seen before on this system, too. Thats why I'm wondering about all that stuff... the game works really nice, I just can't run it the "normal" way and I'm a little p*ssed about that. I have oblivion and it runs great on my geforce4 ti4200 (of course i have to skip some of the eyecandy), but I really wonder how he managed to modify the files so they work on older ps1.0 cards and if it's possible to do the same to Hitman BM ? Well a few post up shows that it's possible. 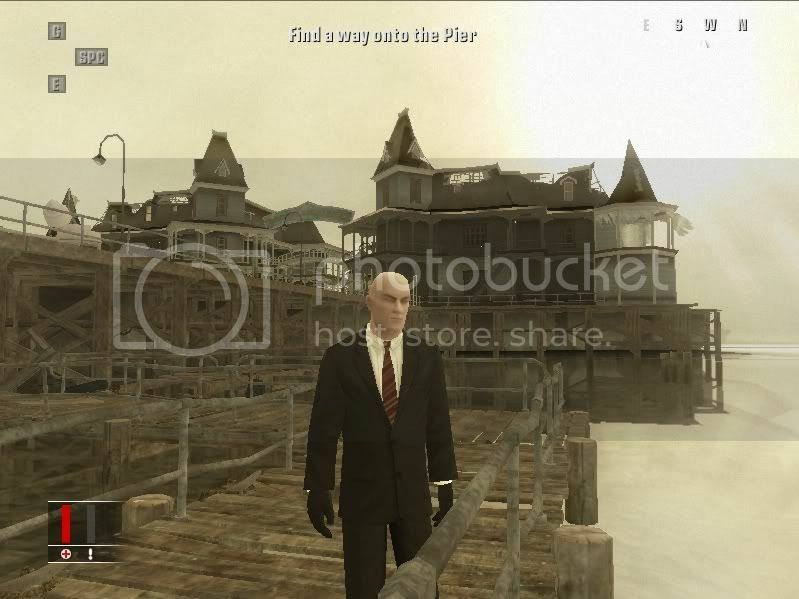 Another prove is that Hitman was developed for the XBOX as well. The XBOX uses a modified GeForce 3 which only supports shader model 1.3 and 1.1! The one with the pictures. I too have a Ti4200 128M card. This game WONT WORK on this card? A bit extreme, isnt that? I can play Americas army at full detail at 1280x1024 sometimes getting 72fps. I can just cruise through Contracts without antistropic filtering at 1280x1024, no chunk at all. With the antistropic I have to lower it to 1024 or 800 depending on the level and amount of post filter. I'm having difficulties with the demo. I tried the fix above because I was having repeated crashes once I got past the initial nvidia and videos. In the theatre in the clancy level of the demo the filtering looks horrible, washes out almost everything I can barely see. Your fix to the ini file worked above. However like some have said, once a gun is fired the game crashes to desktop with an error "error writing to memory reference"
I tried going into the graphics setting, it is set to custom and everything is completely maxed. I try to set it to anything else and the game crashes midstream. While I dont really buy that Eidos took a big chunk of change from the graphics card manufacturers to make it incompatible with my DX8 class card I do think it's somewhat stupid to FORCE the highest graphic settings on the game so it requires the newest VPU features in order for it to work. And this INI file modification thing just to get it to work is brutal. The SysReqs of the game state that it will work with P3-800 Windows 98 with a 64Mb card... how many Windows 98 PCs have a 64Mb DX9 card with Shader2.0? This game should at least play on my machine. Its a current gen machine with a video card that's one generation old. Sure I could upgrade it to a GeForce Ultra but $600 just to be able to play this game? I'm a superfan of the Hitman franchise, going back to HM2. Eidos, is there some sort of a fix on the way for these issues? ..how many Windows 98 PCs have a 64Mb DX9 card with Shader2.0? A lot, considering it's nothing new, but not on Win98. I don't know if anyone actually uses Win98 any more. This game should at least play on my machine. Its a current gen machine with a video card that's one generation old. I think you're slightly mistaken. Ti is GeForce 4. Then we have 5 series, 6 series and now 7 series. Sure I could upgrade it to a GeForce Ultra but $600 just to be able to play this game? If you can, you should upgrade. Not for only for this game, but basically any game that was (and will be) released in 2006 and in the future. I could be mistaken, if you consider a A 6800 Ultra 256M which would now be a generation old and still costs $590 (Cdn) to be a on its way to obsoletion. Or if you consider a 7900FX that is almost $700 (Cdn) to be a merely "acceptable" card. I'd say those cards are very very nice, but certainly not the baseline card in the bulk of machines today. What I was referring to was that my card is a DX8 card, not a DX9 card. ;-) Thats a generation in my books, not every time the manufacturer releases another model. But point taken. I can handle the idea that if I dont ante up the big bucks for the best card on the market, and pop a new one in every upgrade cycle, I'm not going to get to use all of the hottest new features. A Ti4200 Pro with VIVO 128M should be able to RUN the game. I tried every patch and fix upside down and sideways, best I can get it to do is run the game with the colors all wonky and game crashes whenever someone fires a gun. I found a way to possibly make that work but apparently the graphics get so mangled that the WATER disappears. This is a good solid video card, not some hampered $49 dollar card. IMO Eidos and IOI have really screwed up here. You just cant expect everyone who wants to play your game to blow $300+ on a spanking new vidcard, preferrably more than five bills. I say they fix the damn problem or I dont buy the game. Let me decide when I want to drop a five bills on a new card. 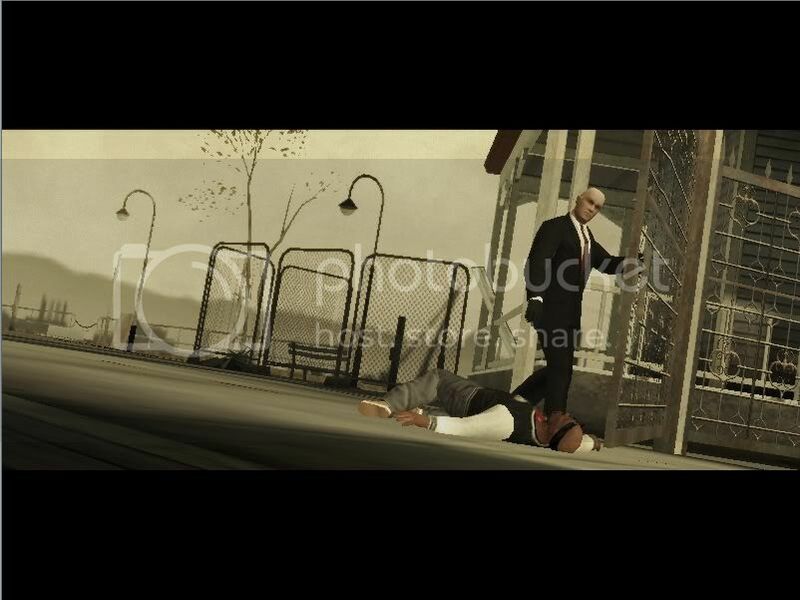 Sorry if it seemed like I was tearing your head off there in the last post, I'm a uber hitman fan and I've been waiting for this game forever so I'm mighty choked that I cant even play it. Of considerable financial impediment to me in upgrading, FYI, is that I have three gaming capable systems in this house; one in my office with the Ti4200, one in the study with an MX440, one in the Living room (hooked to TV and to 12 ft inch LCD projector screen) with an ATI 9550Pro, all 128M, all with a gig of ram . I'd be damned if the living room gets the upgrade before my office... in a way I have to upgrade all three so the $500 card upgrade would cost me $1500... or i'd end up blowing a card from yanking it out and moving it into different boxes of the house. Where do you get these prices? For $600 you can buy the latest, most powerful card out there. For about 160-200, you can buy 7600GT which is very decent card too. For $300, you can buy 7900GT. He lives in Canada, it seems. So, Canadian dollars are not the same as US dollars (I don't know the exact exchange rate, but it's less than 2:1), and the components are probably a little more expensive there anyway due to supply issues. I buy from Newegg, personally, and I don't think they ship to Canada. TigerDirect has a canadian site, but their prices are higher. Oh, Comput, I used to have a ti4200 myself. It was a good card. I bought it in May, 2002 (the week it was released). 4 years is an eternity in computer components. I've upgraded twice since then. And, you don't have to spend $600 on a 6800 Ultra (I agree, it's crazy for a card that is not manufactured anymore and isn't as good as the current super-top cards to cost as much or more). You've got a good chance of getting comparable performance for about $200-300 US. I bought an AGP 6800 GS and unlocked the locked pipelines. It runs at the same speed as a 6800 Ultra, and now that I have the same shader pipes, it basically IS a 6800 Ultra. Oh, Comput, I used to have a ti4200 myself. It was a good card. I bought it in May, 2002 (the week it was released). 4 years is an eternity in computer components. I've upgraded twice since then. And, you don't have to spend $600 on a 6800 Ultra (I agree, it's crazy for a card that is not manufactured anymore and isn't as good as the current super-top cards to cost as much or more). Hey bro, I'm a network consultant. I know whats what and a Ti4200 128M is still a good card. I bought it when it was the hottest card on the market and I never buy anything unless it's currently the hottest on the market... so I wont have to upgrade twice in 4 years. The lowdown is, lots of people have worse cards than me, the card could play the game probably very well if it wasnt for a hard requirement of Shader2, the game was released on XBOX which has the same shader as my card. It was a stupid decision on Eidos' part and beleive me this is going to cost them money. How many people are going to upgrade their card just to play this game? I dont expect the baseline to be in the NV6800 or X800 range for another couple of years. Right now the baseline card you can expect the bulk of users to have to be a ATI9550XT or a Nvidia5000 series FX. You may want to drop 300 bucks on a video card every two years, but in the market sense you're part of the 8% of users who would. Theres another 8% who never will get anything but chipset graphics, and the other 84% of the using population wont be buying this game. Including me. Compatibility to market is the software publisher's number 1 concern. Maybe when I get around to upgrading I'll think about it. In the meantime, there are lots of software houses that want my business - and make the damn game work with my card. I used that argument and was told the PC isn't an XBOX. If you think this move of putting Shader 2 requirement will be a profit loss, think again. Nvidia is sponsoring this game. It could very well translate that Nvidia wants only shader model 2 cards to run this game and nothing lower. If you think Hitman 4 is the only game with absurd shader model 2 requirement, you should Onimusha 3, Resident Evil 4 and Devil May Cry 3 SE requirements. All 3 of them require a shader model 2 cards and a minimum VRAM requirement of 128MB. The weird thing is all 3 of them are a direct port of the PS2 versions. The last time I checked PS2 has no programmable shaders. Upon closer inspection however, all 3 games has Nvidia's sponsorship. Upon closer inspection however, all 3 games has Nvidia's sponsorship. I would no longer be buying Nvidia if this is the case. I will do research.